Phonsavan to Vang Vieng, tubing! A town built around the drinking backpacker. 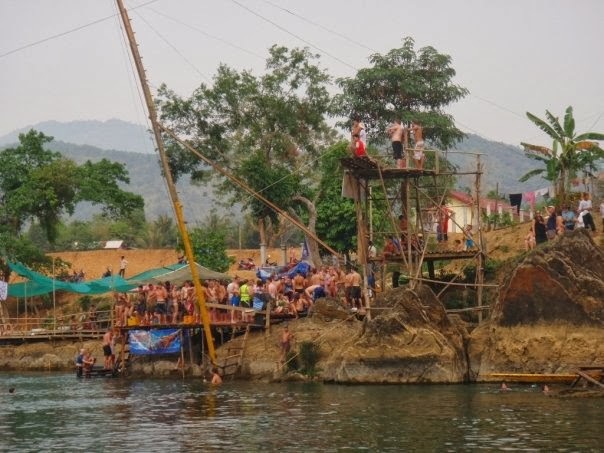 Vang Vieng is famous for drinking, tubing and playing Friends all day long in the local restaurants. There is no culture, the average age is about 23 and everything is for the backpacker. We met up with two other girls that we became friends with in Luang Prabang (London and Holland) so there were four of us. On our first full day we went tubing which is actually more of a bar crawl because the river consists of bars every 50 feet. The tubes are really just for show as you float to the next bar. It was an awesome day and something that you really can only do in Asia were safety rules don't exist. The next day Sara and I spent the entire day watching friends and eating all three meals at the same restaurant. Yup, we did everything in Vang Vieng that you are suppose to do except for the caves because it rained the third day we were there.